This Handheld Telemetry Display with Single Input module provides an 8 digit LCD reading from any of the T24 Acquisition modules (strain gauge, voltage, current, temperature, pulse and potentiometer ). The acquisition module can be ‘powered on’ and ‘powered off’ automatically by the T24-HS handheld. Status indicators inform the user if the remote acquisition module has input integrity problems, low battery, low signal, over range or other error. The display can be toggled between gross and a tared value and can optionally be scaled to change measurement units. The licence free 2.4GHz direct sequence spread spectrum (DSSS) radio telemetry technology offers high integrity, error free communications which can co-exist with other wireless technologies such as Wi-Fi, Bluetooth® and Zigbee®. FCC, ETSI and IC approvals. This Handheld Telemetry Display with Single Input module uses a pair of standard alkaline AA batteries and is configured using free T24 Toolkit software which runs on a PC connected to a T24 base station. 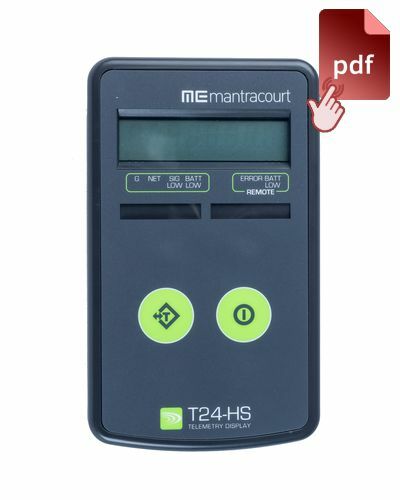 The T24-HS handheld display is typically seen in applications requiring wireless loadcell measurement or wireless strain gauge display.